For sure envisioning some float tests being done! In the spirit of black history month... "I have a dream"
I realize its a unicorn, thats why im posting here. If anyone knows where one might be, it would probably be someone on here. This may ruffle some feathers but im looking for one to do a CC with. Notched transom with a single 300, flat cap and phonebooth style console. I like fiberglass arts and crafts too, but those receipts add up. The 25 is a deal if you want one stock with a bracket. There was a 25 seafari project on THT about a year ago. it's a grey 25 that the owner started to cut up and make into a cc. There's been no updates on it for a while. You might be able to snag that one. I like the transom mounted outboard idea. I figure ill be in for about 1/3 of what a 15 yr old cookie cutter "top tier" 25 with original motors is going for these days. Lucky to have generous builder friends around here! Thanks for the link, i wrote him Monday actually. Said hes still got it but was distracted with another project at the moment. Told him to keep me in mind. He got it for free so ive got that going in my favor i think, fingers crossed.
" i only keep receipts of the things i might need to return"
How much did my 25 cost me this year???? Damn if I know and I intend to keep it that way. The only other ones I keep are repair records so I can remember what's been done, trying not to remember the price pain. Cant take it with ya when youre gone they say! 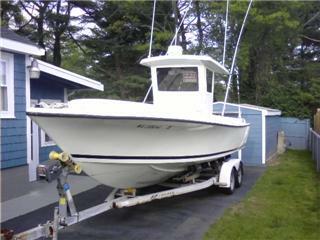 This was Richie Carvalho's old 25 that big fluke bought, before it went to Hawaii. I suspect the pilot house came off when the 25 went into a container for shipping. Coincidentally one of the senior engineers that managed the 25 seafari project for Steven Loui now works at WHOI. If I remember correctly he said there were four or five 25 seafari's that went to Hawaii. I think there was one more. Mike - I really like this configuration for the 25.